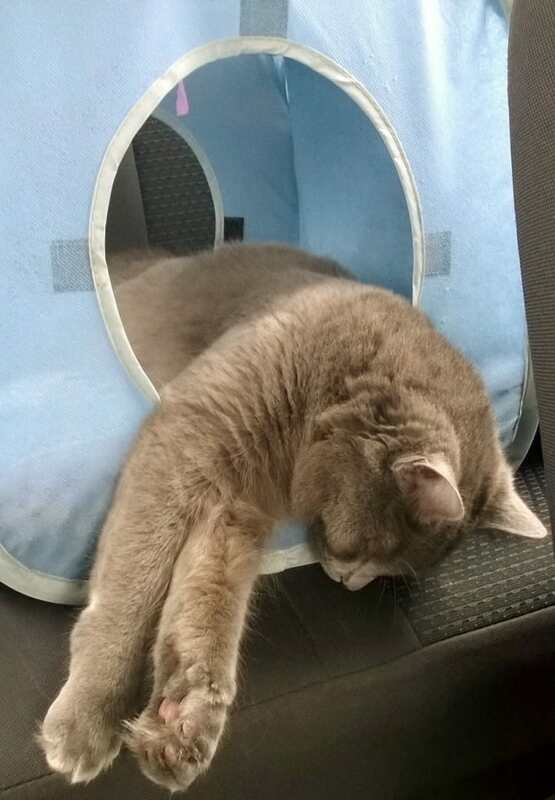 Do you dread trips to the vet because your cat hates the car? Then we have news for you! 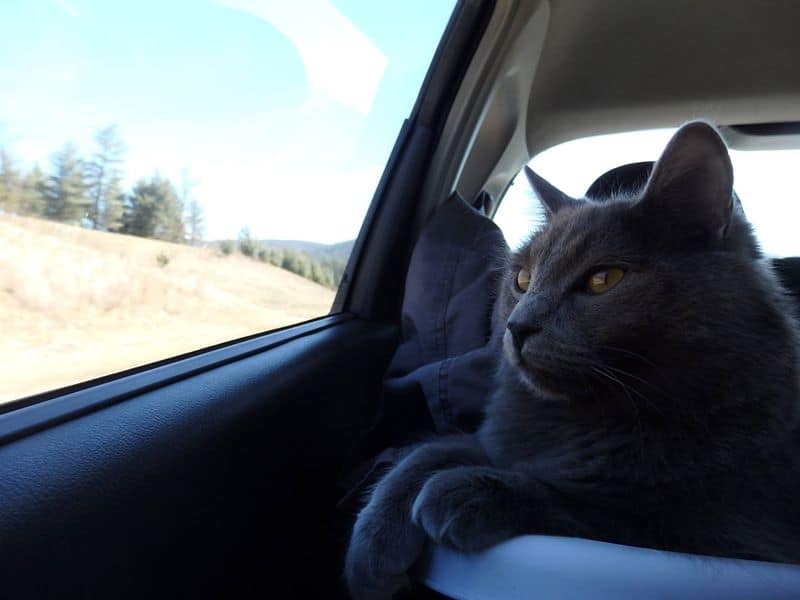 Traveling with a cat in the car doesn’t have to be stressful for you OR your cat. Training your cat to ride in the car is a long-term, wise choice as a cat owner. Inevitably, your cat will need to go in the car for vet trips. 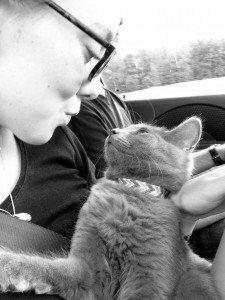 What if you could take your cat on fun road trips, instead of just going to the vet? What if your cat could enjoy the car instead of despising it? 10 easy steps to safely transport your furry friend with you wherever you go! Introduce your cat to the car slowly, while it’s off and in park mode. Start the engine and observe your cat’s reaction. Don’t rush into driving. Provide a carrier or bed to ensure your cat’s safety and comfort. Pack a handy bag with your cat’s essentials (food, water, collapsible litter box, etc.). Give your cat a chance to potty, eat or drink (a light meal) before leaving the house. Check up on your cat during the car ride. Encourage them to lie down and sleep. Take pit-stops and short breaks to allow your cat to stretch, use the litter box, etc. Provide familiarity and comfort once at your destination. Reward with plenty of treats and cuddles! There is no need to worry about scratches on your car seats or a kitty that won’t calm down as soon as the engine turns on. 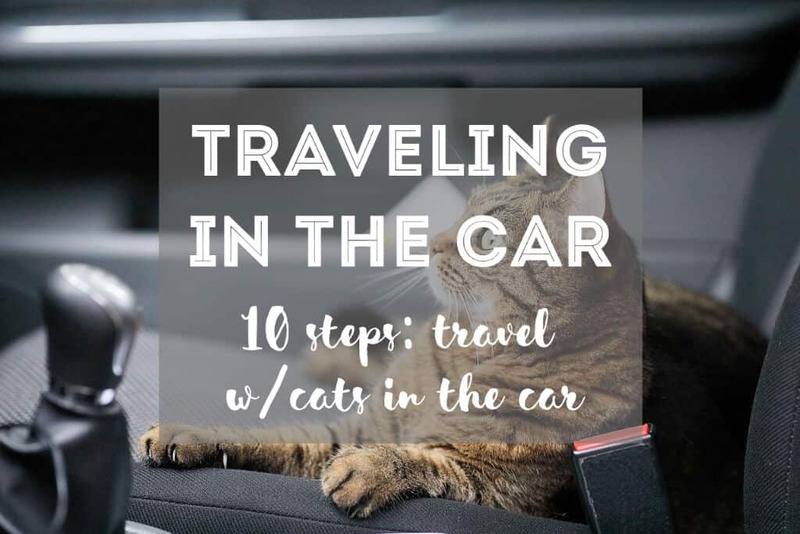 Following these steps will ensure your cat is healthy, safe, and calm while traveling with you in the car. Yoda enjoying the scenic views of Western North Carolina! If you have a skittish feline, you will need to train your cat to not fear the car. It is a new environment, after all, so your cat will need some time to adjust. If possible, start training your cat to get used to the car at an early age. This will allow them to feel as if going in the car was normal right from the beginning. Introduce your cat to the car slowly. Start by introducing your cat to the car, while it’s off and in park mode. Let them sniff around the seats and explore. To make your cat feel more at home and get used to the car environment quicker, it would be wise to bring some toys and treats with you to reward good behavior! If your cat is comfortable enough (not meowing or stressed), the next step would be to start the engine! Cats can get scared at the noise and vibrations of a car, so just take it one step at a time! Remember to not rush into driving as this can scare your cat for good and ruin their chances of enjoying traveling in the car. Encourage your cat to lie down and get comfortable. To ensure safety for your cat and for the driver, find a comfortable travel bag or carrier to transport your cat to/from the car securely. Providing a space where they can hide out in also helps them stay calm while riding in the car. Securing your cat in a carrier while in the car is optional, but highly recommended! Some State laws even require pets to be in a carrier while driving. Pets loose in the car can create distractions and can cause accidents. To avoid injury to your cat, yourself and others, most States require or recommend securing your pets while driving. Insider Tip: We personally do not keep Yoda in a carrier at all times while in the car because he sleeps the entire way. He usually lays in the passenger seat or is curled up in a ball on someone’s lap. If awake, he likes to look out the window. 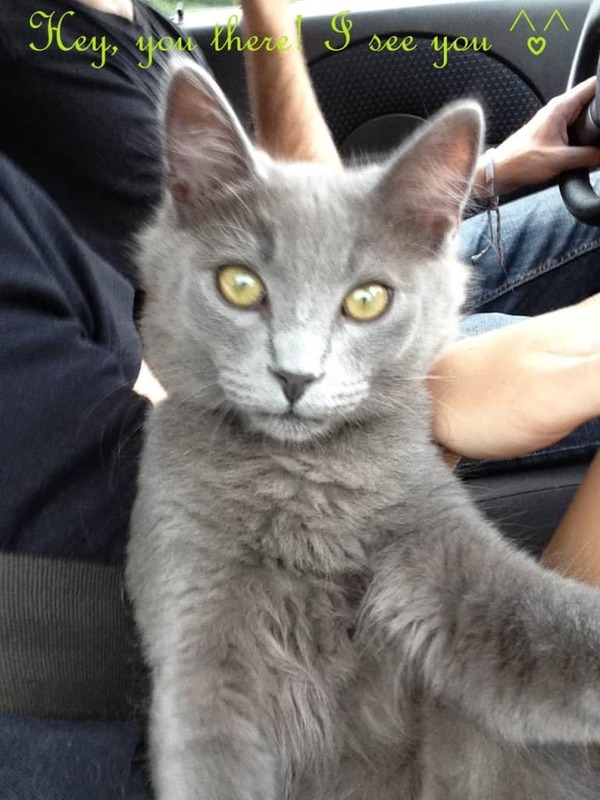 He was acclimated to traveling at 10 wks, so before deciding whether to let your cat loose in the car, make sure you know your cat’s needs/reactions to traveling and travel time. We do however keep a travel bag (i.e. our cat backpack and carrier) with us in the car for easy transportation and to have it just in case. It is also highly recommended that whenever you travel with your cat in the car, always make sure you have your cat’s identification tag or have your cat microchipped. Having your cat microchipped is the most effective way of finding your cat if he/she escapes or gets lost in the case of an accident. Yoda enjoying the sun on a quick break from his car carrier. When you travel with your cat in the car, make sure to pack a handy bag! This includes water bowls/bottle, food, and food bowls, (I also bring treats), toys, a litter box (travel size or regular size), plastic bags, a pooper-scooper, and something comfy to lie on/in, like a small blanket or bed. In addition to toys, I often like to bring Yoda’s pop-up cube for him to go inside and sleep in. Give your cat a light meal if you plan to travel as to avoid any car sickness (if your cat has a sensitive tummy). Also, make sure your cat takes their last trip to the litter box before packing it up. Play with your cat before the car trip so they will be more willing to lie down and sleep once in the car. We usually have Yoda chase a laser for 5 minutes before leaving, that way he is all worn out in the car and can go to sleep easier. Cats need to feel secure. There will always be a few bumps in the road or a loud truck that passes by. In order to keep Yoda calm and feeling secure, we bring his pop-up cube (or a bed or carrier) so he can go inside and sleep. Keep checking on your cat to ensure their safety and comfort. By providing Yoda a place to feel secure and comfortable, he feels relaxed and can enjoy the car ride. At the same time, this will keep him away from the driver’s seat or from needing too much attention. We highly recommend bringing a bed, box, pop-up cube, or something transportable that your cat likes to go in and sleep. This will entice your kitty to keep off your laps or the seats and go lie down and have a nice nap where it’s quiet and cozy. Depending on the length of your trip, don’t forget to take a quick break to allow your cat to have a few laps of water, have a snack, or use the litter box. I would avoid giving your cat a full meal while traveling in order to avoid any car sickness. Give your cat access to the litter box as he/she may need to go potty! Doing this will avoid any unwanted messes in the corners of your car. You might not need to do this for short car trips, but do offer the option of the litter box for longer car rides. Once you reach your destination, there are some things you should take into consideration. Even for 5 or 10 minutes, temperatures can soar up to 120 degrees F in your car on a hot day in the summer. It is not wise to take your cat with you in the car to go grocery shopping, or when you need to run errands. 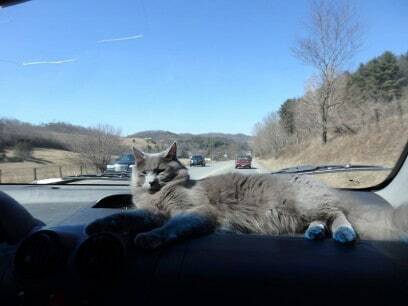 If you travel with your cat in the car, always plan to take them with you once you’ve arrived at your destination. Otherwise, your cat can stress even more without you present. You don’t want to reverse all of your cat’s progress. Whether you plan to stay overnight in a hotel, at a friend’s house, or elsewhere, always provide a set-up where your cat knows to go and can feel safe and comfortable. New places for your cat can cause a bit of stress. I recommend bringing some of your cat’s favorite toys & treats when going on car rides. I try to mimic the set-up as if Yoda was at home, so he knows what’s his and where he can go. 10. Reward your cat with plenty of treats! At the end of your car ride with your cat, make sure to reward your cat with plenty of treats and cuddles. Helping your cat associate the car with positive rewards will help teach your cat not to hate car rides. Please send us your questions or comments and follow us on our social channels to never miss one of our articles about cat travel.